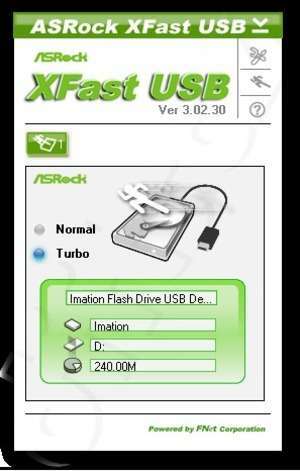 XFast USB is a program created by ASRock which was designed to speed up file transfers from USB flash devices and other mass storage devices connected to the USB port. The application includes two separate modes: Normal and Turbo. Needless to say, the former is the fastest way to copy files. The program was created specifically for ASRock motherboards, therefore you're going to have to own one in order to use this application. Version 3.02.38 is a freeware program which does not have restrictions and it's free so it doesn't cost anything. For security reasons, you should also check out the XFast USB download at LO4D.com which includes virus and malware tests. Additional screenshots of this application download may be available, too.